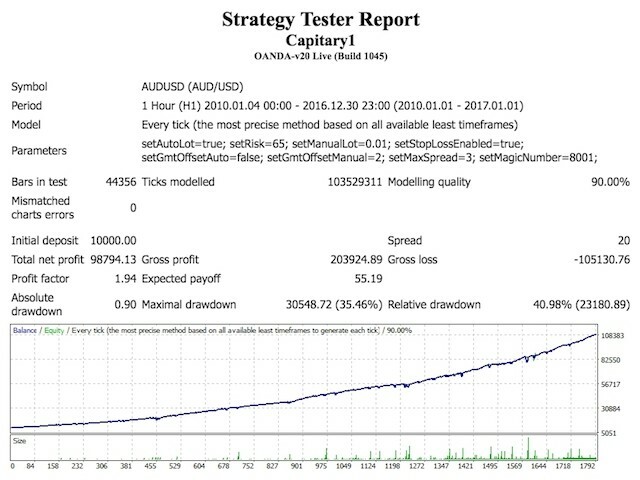 Capitary is designed to open trades every day. 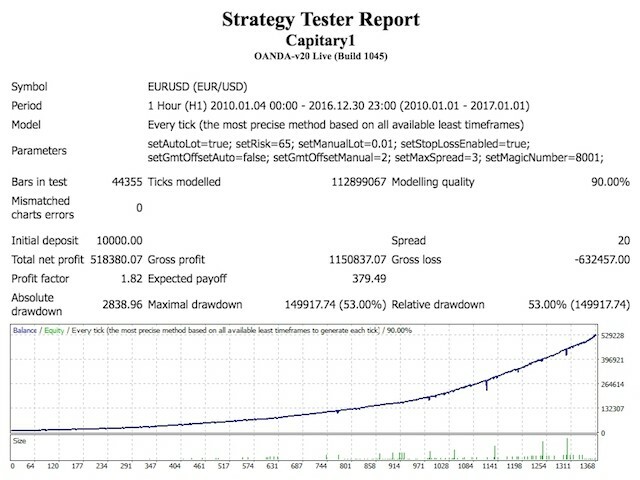 This Expert Advisor implements 2 trading systems: one for the EUR/USD currency pair, the other for AUD/USD. TakeProfit is always unique and adjusted to the current market situation. This robot does not hold trades open for a long time. Orders are usually closed within 1-4 days. In addition, each trade has StopLoss calculated using a special technology. This technology does not allow losing more money than specified in the settings, even if the system fails. Since StopLoss limits the drawdown, your account is secure. Even if you lose Internet connection or terminal turns off. Auto Lot - enable/disable the automatic calculation of volume for the first order (based on the "Risk for Auto Lot (%)" parameter). Risk for Auto Lot (%) - parameter for calculation of the first order's volume. Used when the "Auto Lot" parameter is enabled. Specified as a percentage. Manual Lot - volume of the first order. Used when the "Auto Lot" parameter is disabled. Stop Loss - enable/disable the use of Stop Loss. Auto GMT Offset - enable/disable automatic detection of the difference broker the GMT and the time set on the broker's server. Does not work when backtesting in the strategy tester of the terminal (set to false and manually define the value using the "Manual GMT Offset" parameter). Manual GMT Offset - manually set the difference broker GMT and the time set on the broker's server. Used when the "Auto GMT Offset" parameter is disabled. Specified in a number of hours. Max Spread - maximum allowed spread for opening the first order. Specified in points for 4-digit quotes. Recalculation for 5-digit quotes is automatic. Magic Number - unique number. In most cases, changing this parameter is not required. Great EA, I will buy it. Thanks Stanislav, waiting for more EA's of yours.